Acclaim. Developed by Bits Corporation. They bite and fight and bite. 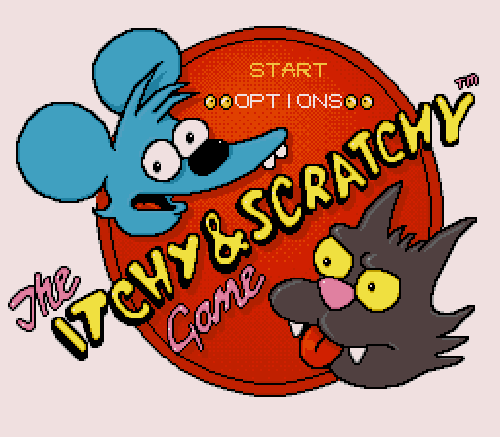 The Itchy and Scratchy Game! Choose this option to start the game. difficulty options are Easy, Medium, Difficult. is an insanely simple task. It's best to be in a large area where no enemies attack you. time it you can easily hit him before he hits you. 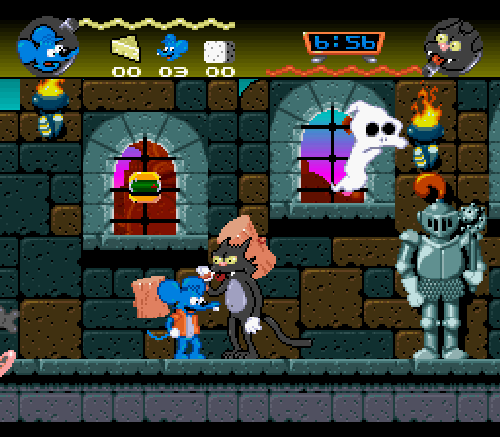 you even attacking him (Hint: Pusseidon Adventure, eel)! clones run free here and so do the Kretaceous killers. So, you think that a simple turtle should be no problem? Yea right! 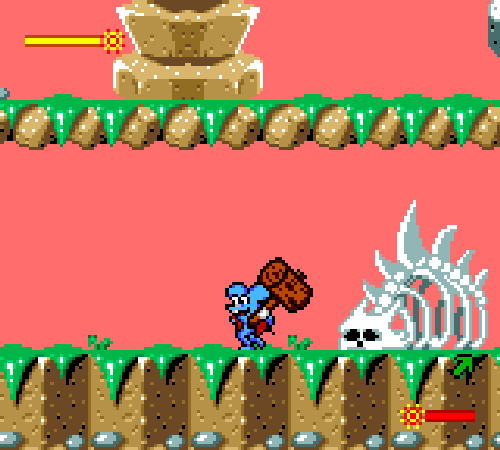 the stages to get the weapons, or kill the clones in the boss stage. the boss stage, but after that it's smooth sailing. 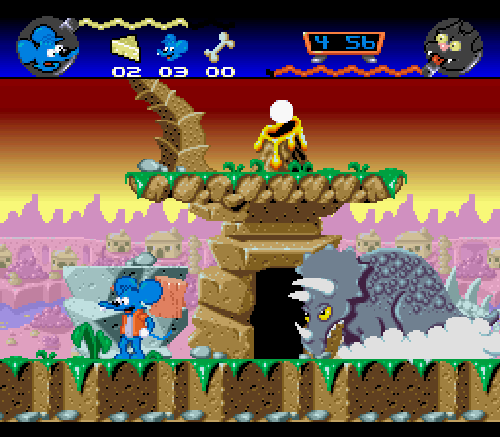 Scratchy clones, and little dragons. follow you so just concentrate on getting all the stones you need. pirrrate dogs, sea guuuls, and eviiil clones, arrr. Warhead (a sour candy, real sour...)! Right, so the boss is hard. reach, so gather about 30 of the balls. orange fishes and shoot Scratchy when he comes out of that fortress. 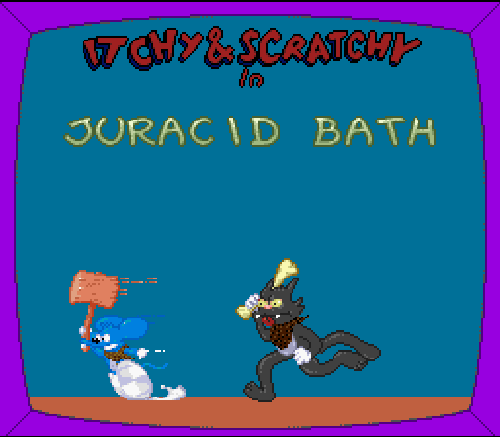 getting a hit on Scratchy is very difficult. if they're gonna hit you then oh well. Damn, looks like you have to work at getting those starfish weapons. DO NOT hit it. That will cause a piece of the floor to give way. deal with cacti, cowboy clones, and quick sand! 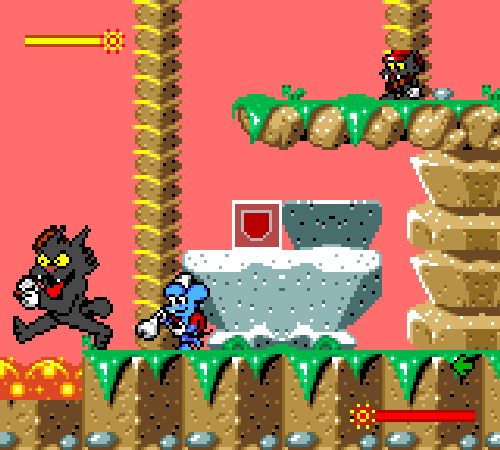 spot where the clones and Scratchy's dynamite sticks don't hit you. one in time. Supa' easy. the clones, buzz saws, and junk piles to get to Scratchy. be exposed. You'll get about one shot each time it lifts. technique you should have it. avoid them all, but avoiding the majority should be easy enough. 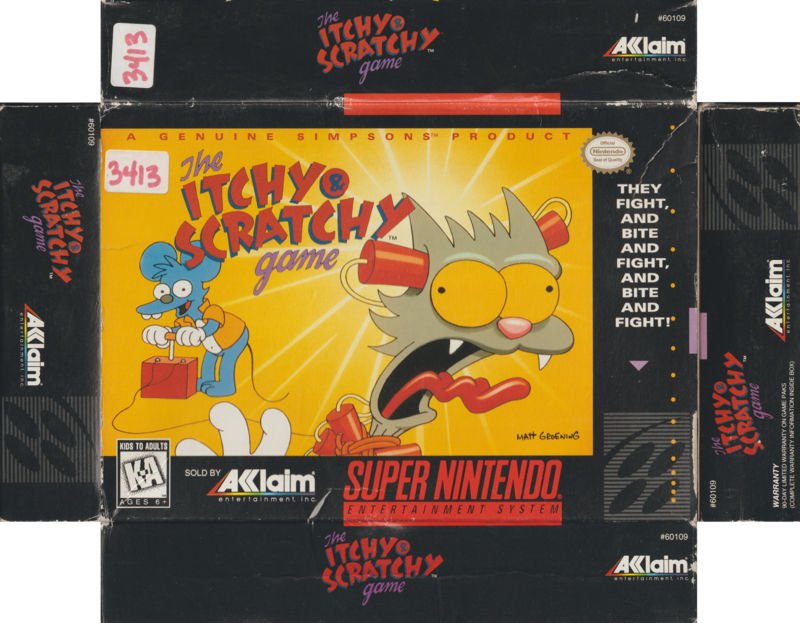 Congratulations, Scratchy is now a pile of putrid kitty mush! Oh, AND YOU BEAT THE GAME!!! is empty. If you find something that I didn't, just contact me. I reworked the original FAQ and created this new version. Enjoy! 4. 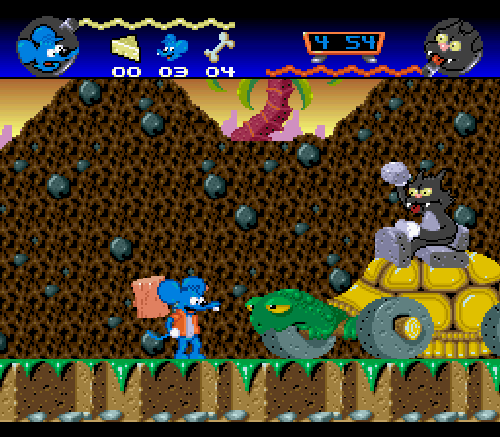 Sega and Bits Corporation for making this game possible. 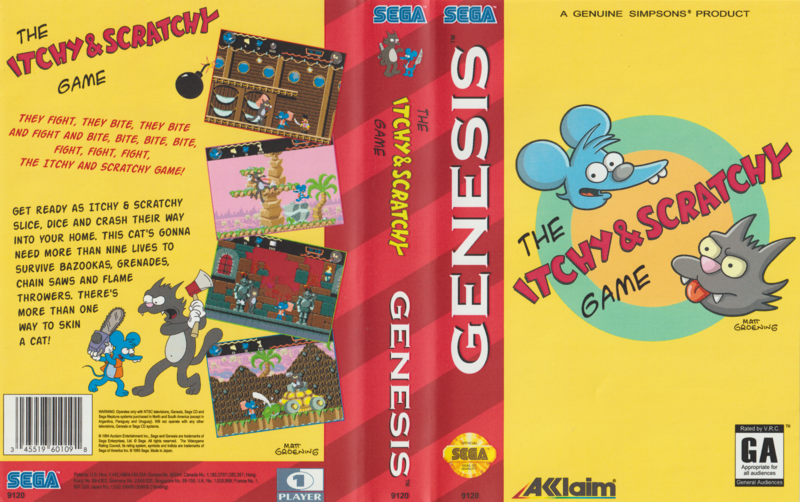 The yellow bar at the top is Itchy's health. 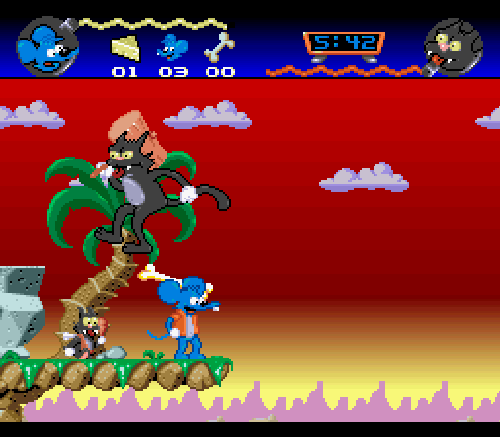 The red bar at the bottom is Scratchy's health. 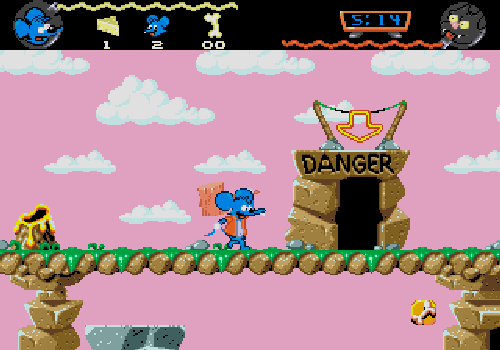 That arrow points to Scratchy's location. Keep an eye on it. guide. 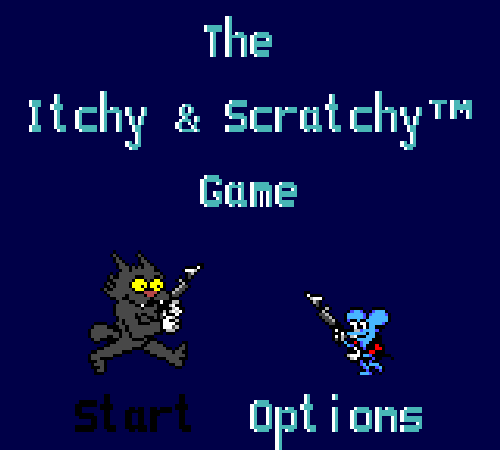 Trust me, killing Scratchy is an insanely simple task. bowls, and an Itchy head. you, and the red arrow means he found you and is chasing you. platforms of stacked rocks), climb up to the top two floors. 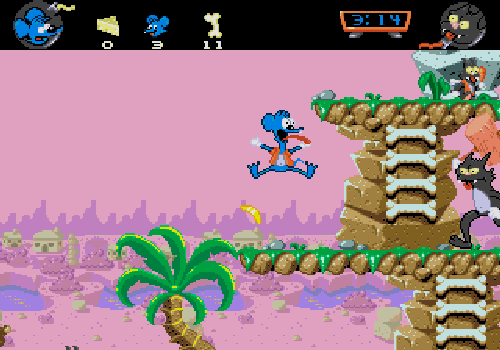 Kill any clones and pterodactyls that you see and climb the ladder. know that was wordy, but it's real simple. edge at the right time so that you are able to hit him from behind. Then jump on top and repeat the process. limit. Stick to the table method and you should be fine. pirrrate dogs, sea guuuls, and eviiil clones, arrrrr. Oh man, what is that I see? Ladders, ladders, and more ladders!!! so if ya wanna go on just kill him quick. 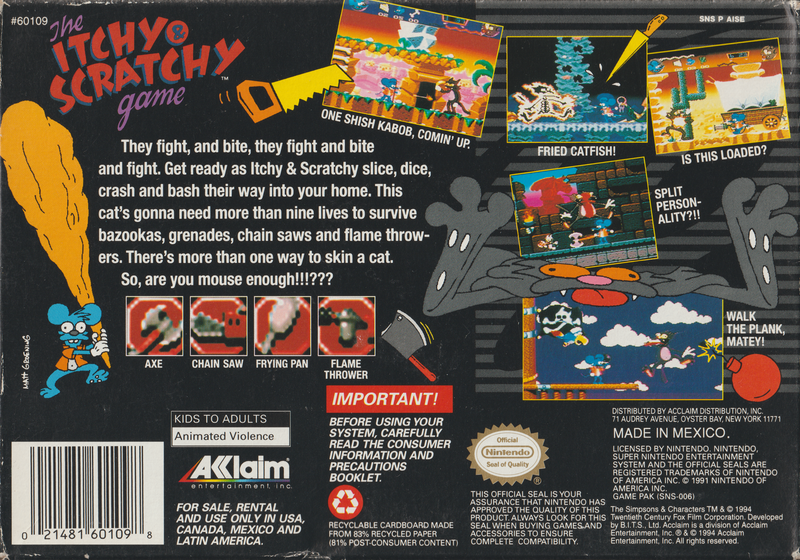 buzz saws, and junk piles to get to Scratchy. time Scratchy will jump up to your level. cacti, cowboy clones, and quick sand! just jump over and attack him from behind. actually, with ghost towns and such, so go ahead and look. 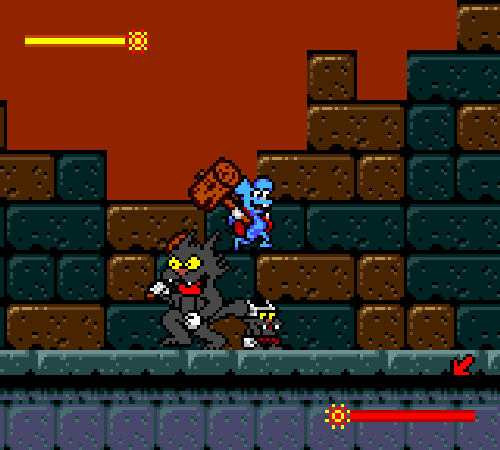 so that when Scratchy jumps I hit him, but he can never reach me. 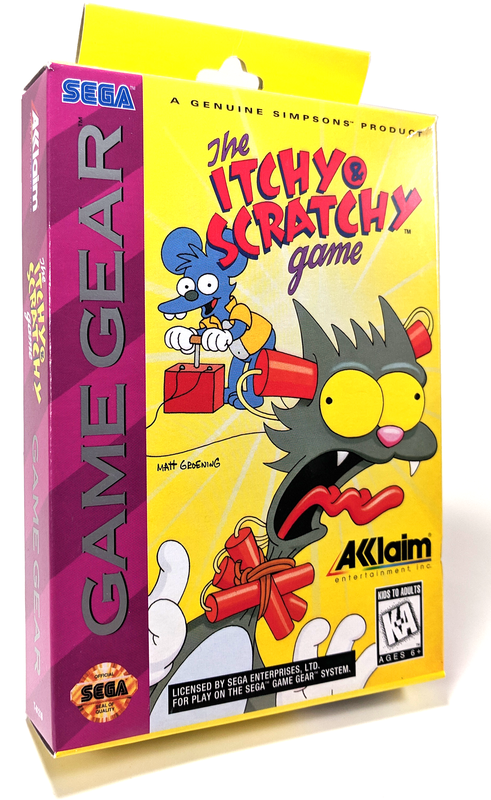 Scratchy is at the other side of the gears. get them if ya think it'll be useful. First new version. Have fun! the highest point in the stage, which is usually a small platform. tested the tips, but I suppose there's always a fluke. hit the hatch on top of the sub. approach you. 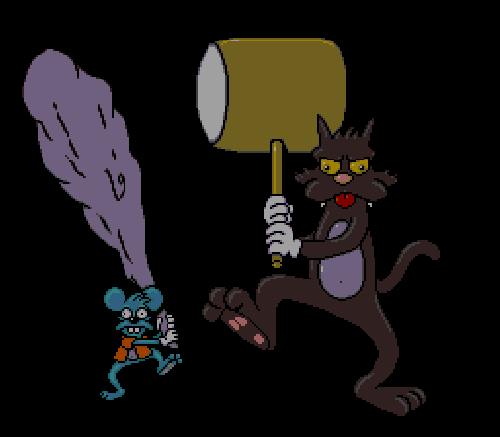 Once you have 25-30 bricks you can go attack Scratchy. bricks at Scratchy. Real easy. need to. 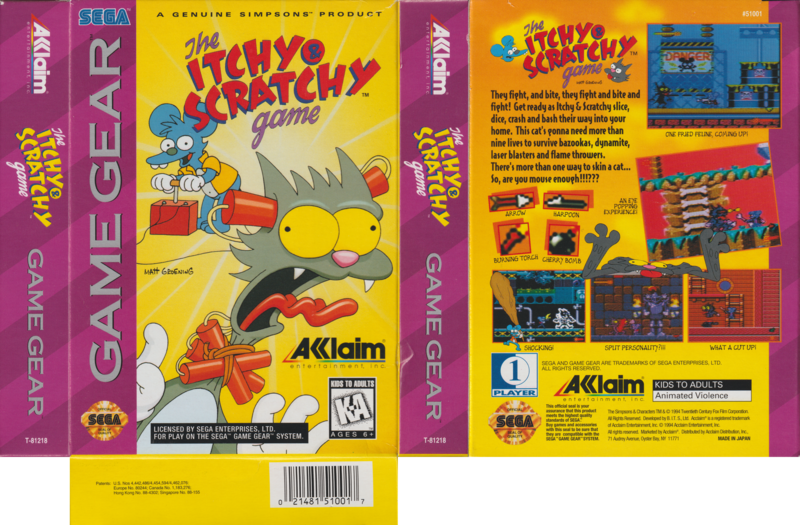 Then it's Scratchy-killing time. Go all the way to the right and stand next to that arm at the end. you'll get him without a problem. 4. 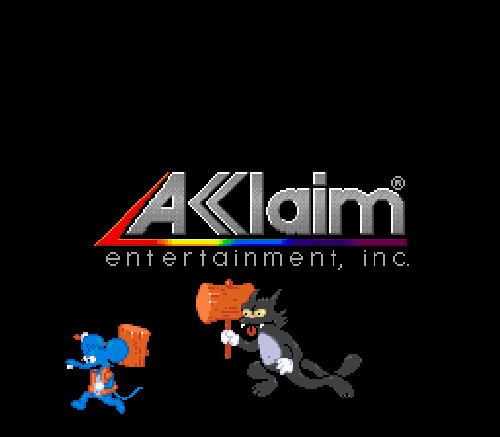 Nintendo and Bits Corporation for making this game possible.